I have Switzerland to thank for some amazing memories, beautiful scenery, and our latest kitchen gadget. (“Kitchen gadget” said with my fist raised, a silent “arrgh,” and scowly look to Jan. My ongoing battles with kitchen gadgets are cataloged here (dehydrator), here (pasta machine), here (ice cream maker), and here (sous vide water bath)). Much as I wanted to hate it (and did, when it arrived from Amazon.com), I think it’s pretty cool. To Americans, Raclette is the lesser-known cousin to Fondue, though both are dishes based on combining an assortment ingredients with melty Swiss cheeses. To make fondue, cheese like Swiss cheese and Gruyere cheese are melted together with garlic, white wine, cherry brandy, and spices in a large, heated pot. Chunks of bread and cooked vegetables are dipped in the cheese with skewers or forks once the cheese is melted and smooth. It makes for an interactive meal when you must decide what to dip and in what ratio (think: just a hint of cheese, or, completely immersed and dripping with cheese). Even more interactive though is Raclette. This involves a machine that is part George Forman Grill, part toaster and broiler. The top of the machine is the grill part, and beneath that is the toaster/broiler. 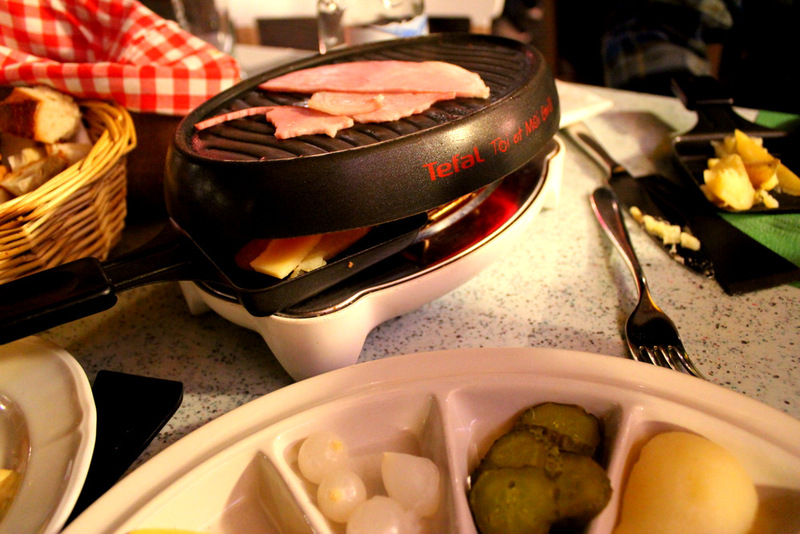 When you order Raclette in a restaurant, you will order by the type of meat that you will be grilling. In Zurich, we ordered farmer’s ham. First, the waiter came out with our machine, set it on the table between us, and plugged it in to get it warmed up. Later, he came out with a dish of many compartments. In the largest were big pieces of ham, and in the smaller sections, an assortment of ingredients including baby corn, cooked broccoli florets, pear slices, mushrooms, pickles, and cocktail onions. Next, the waiter came back to our table with a small burlap sack, filled with about two pounds worth of small, boiled potatoes. We stared at each other, bewildered, wondering what we were “supposed to do” with all this stuff. When we saw the waiter again, we asked him. He told us that we grilled the meat at the top of the machine. While it was grilling, we were to take out the wedge-shaped spatulas called Raclette plates. These plates had a small lip all around (to keep food inside), and a heat-proof handle. In these, we were to place whatever combination of cut-up potatoes, vegetables, and fruit. On top of that, a slice of Raclette cheese, and into the toaster/broiler under the grill until the cheese was completely melted. Or, we could simply place the slice of cheese onto the plate, melt it, and scrape it over the potatoes and other ingredients. By this time, the ham on top should be nice and brown, with beautiful grill marks. We were to scrape off the contents of our plate, add the ham, and sprinkle everything with nutmeg and paprika. Phew! There were a lot of steps, but when we took a bite, it was worth it. While melted cheese, potatoes, and vegetables might seem simple, the addition of the paprika and nutmeg created both a simplicity and depth of flavors that kept us making more plates to place under the grill. The fun was deciding what to include in each one, because different combinations of flavors made for different results. For example, combining the sweet pears with the cheese and potatoes made for a balance of sweet and savory, or going for vegetables with pickles was savory mixed with sour. The Raclette machine we used in Zurich was for two people (two plates and two compartments for heating them), so of course when we returned home, Jan had to get something bigger. The Swissmar machine he ordered had eight plates and eight slots for heating, though Jan assured me, of course we didn’t have to use them all at once! On the night of my 30th birthday, Jan brought out the Raclette machine, ham, and an even larger assortment of accompaniments than we had in Switzerland. While the potatoes weren’t served in a burlap sack (we used a bowl), we had everything we had had in Switzerland, plus more. Perhaps it was because we’d done this a time before and now envisioned ourselves Raclette pros, but this time tasted even better. Each time I made a plate to place under the grill, I said it was “the last one,” but it was so good I kept making more. Because this dinner is so interactive, it takes a while to enjoy, so perhaps you can eat more, if only for the reason that you’re sitting down at the table for some time. I don’t know how often we will get out the Raclette machine, or if it will soon be forgotten amongst our other many kitchen gadgets, but you never know. While we’ve used our fondue pot only once for cheese fondue, we do use it all the time to keep meatballs warm when we have our Smörgåsbord dinner. There may be some yet-undiscovered additional uses for the Raclette machine, or we may enjoy this just as we did in Switzerland, the way it was intended – with delicious results. This sounds so fun! I would love to try it with you guys sometime! The Raclette cheese round is heated, either in front of a fire or by a special machine, then scraped onto diners’ plates; the term raclette derives from the French word racler, meaning “to scrape,” a reference to the fact that the melted cheese must be scraped from the unmelted part of the cheese onto the plate. Raclette is one of my favourite dishes. Expecially during winter.